I’m having all sorts of adventures these days, which is a really fun carrot to dangle in front of my nose as I plod through the scintillating reading on the nervous system. I know that sucker is important, but man…could you BE any more boring? The other day, I was high on the success of my cheddar cheese, so I was bragging to anybody who would listen. 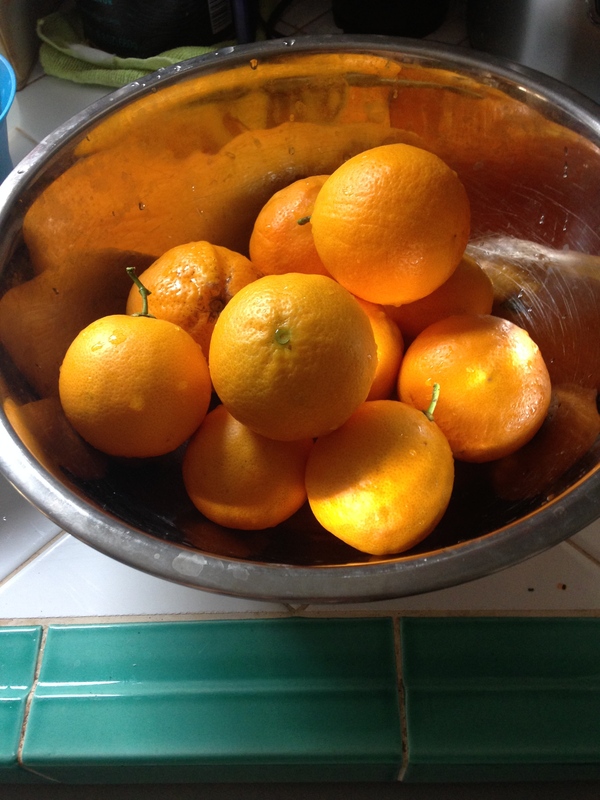 My neighbor and I got into a conversation about homesteading in general, and I mentioned my compost bin, she mentioned the vast quantity of not-so-sweet oranges she was in possession of (from a tree hanging over her property), and long story short, I walked away with about twelve pounds of oranges and a plan. I decided to go with “traditional” orange marmalade. This is funny, because marmalade is not a recommended “first canning experience”, since you have to activate the natural pectins in the rind of the fruit (more on that to follow), and its not always easy. However, you know me. Cheddar cheese is not a recommended “first homemade cheese” experience, and I blithely ignored that advice. So here we are. 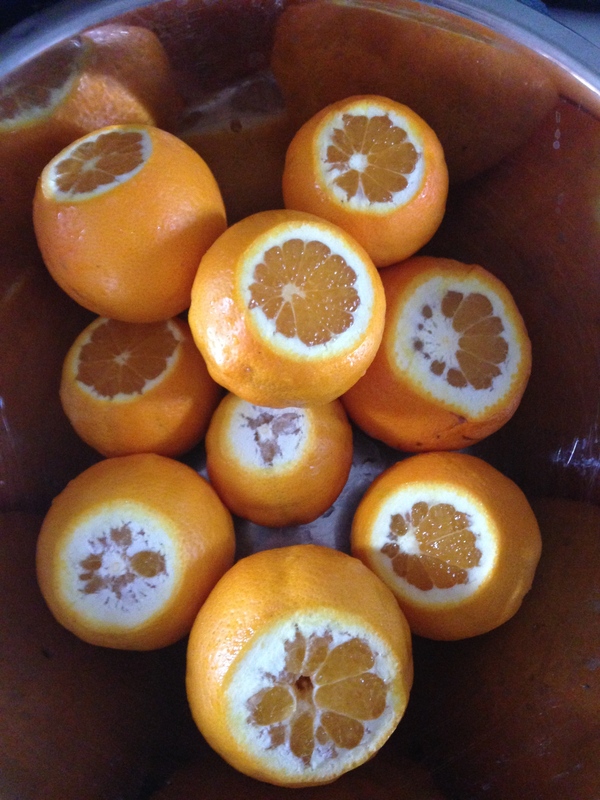 A little how-to on what might turn out to be a delightful batch of orange marmalade for my homemade sourdough! 1. First you take a bunch of oranges. Peels on. Wash them, because you will be using the peel in the recipe, and you don’t want to use the peel AND the quarter inch layer of city-scum on top of the peel. You will need about THREE POUNDS of oranges, which, depending on what size you use, turns out looking like that. 2. Cut the tops and bottoms off the oranges. This provides a nice linear surface for the next step, which I don’t have a picture of. 3. Now, don your Kevlar gloves and use your mandolin slicer to make 1/8″ slices. Try to set it to a place where the slices aren’t so thin that they will fall apart, but not too thick. Slice and dice while being very careful not to lose a finger or two. What the heck is a mandolin? 4. Once you finish slicing and dicing while nimbly avoiding removing the tips of your fingers, quarter the slices as best you can. 5. Take one lemon, zest it and juice it. At this point, you want to start prepping your canning supplies so that you don’t have to run around like crazy while you’re waiting for your marmalade to set up. 6. Take all your jars (plus a few extra, because you don’t want to be caught in the lurch by a bountiful batch), wash them and the lids with hot, soapy water. 8. Place them in the water bath (I splurged for the actual one, but a very large pot with a lid will also do just fine). Bring to a boil and then simmer for about fifteen minutes. Keep ’em warm until you’re ready to use them, so that the molten preserves you pour into them do not cause the glass to crack. 9. Repeat the above simmering process with the lids of the canning jars, although not the spanners, because you want those to be cool enough to be handled. 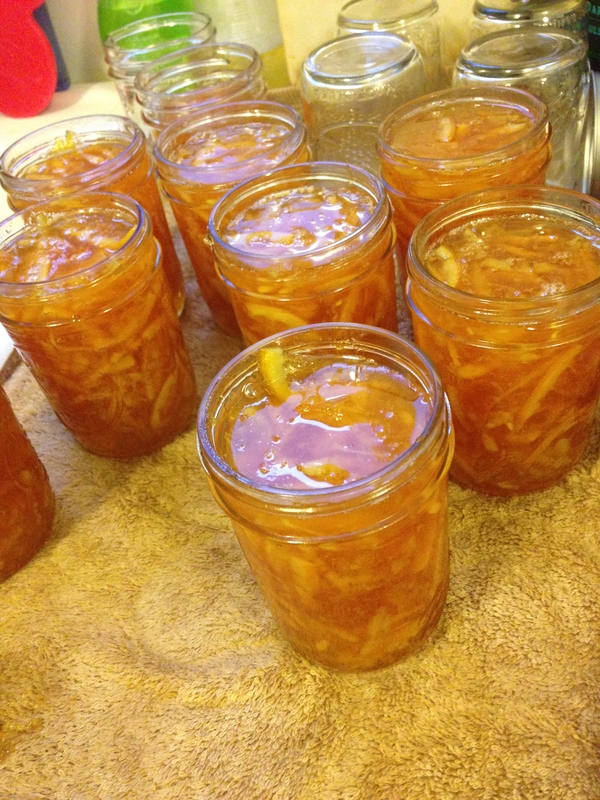 Okay, back to the awesome marmalade that you are slaving away at. 10. Take your orange slice-n-dice mixture, add sugar, lemon juice, lemon zest, and water. 11. Bring that bad boy to a boil and reduce to a simmer for about forty minutes, or until the fruit is soft. 12. This is where it gets a little frustrating. At this point, all recipes tell you to turn it up to a hard boil for fifteen minutes and VOILA! Perfect marmalade, eet ees youras! Not. I had to boil mine for almost an hour, testing regularly, until it achieved set. Some very helpful forums talked me through my anxiety. 13. Once its set, put it in jars!! Leave a 1/4″ of head room (space between the delicious jam and the top of the jar). Then, put your lids on (a magnetic lid grabber helps save your fingertips yet again as you fish the lids from the boiling water), tighten the spanners to finger tight, and put them back into the water bath. Take ’em out, take the spanners off, let them cool for eight hours, and EAT. Or give away. I think I will consume mine on homemade sourdough! ← I made some cheese! For sure I am now dying to try your cheddar recipe too! That was a great success!! Do let me know how it turns out. Recommended that you get the cheese press, it makes life a hundred times easier. Plus, an excellent modern art piece for the mantle.